Hotel-type service and facilities with private rooms, restaurants and lounges. Some do have swimming pools. Rather anonymous as they can accommodate up to 200 guests. Meals are a buffet-style affair. Buildings are solid walls and your en-suite bathroom is most likely tiled with proper shower facilities, flushing toilet and running hot water. Your room has a hotel-like infrastructure, i.e. WiFi, TV, power outlets and sockets. Intimate feel as they generally only accommodate up to 24 guests. 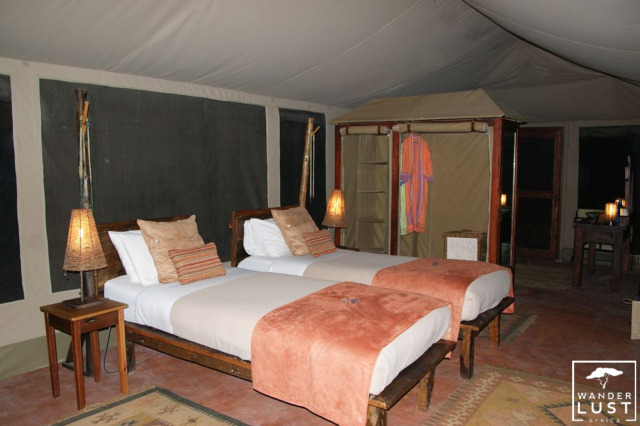 The tents consist of canvas walls and depending on level of luxury are equipped with high-quality furnishings, en-suite bathroom facilities and private deck for observing wildlife. Bathroom facilities consist of a bucket-like shower, septic toilets and perhaps a water jug next to the hand-wash basin. Power is mainly generated through solar energy and you only have power outlets in the main areas. Often you have a communal table where you share your meals with other guests. Dinners are very exquisite and consist of three or more courses. 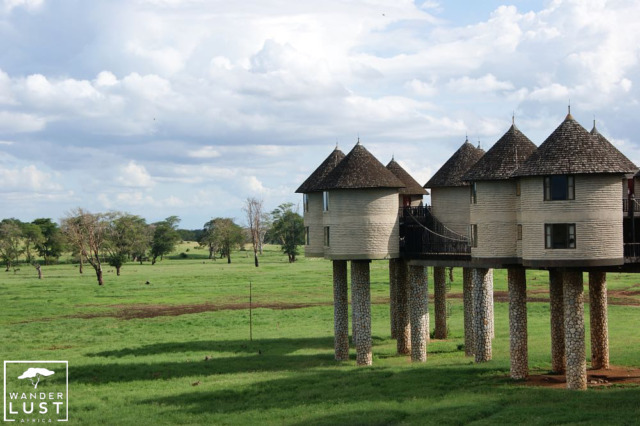 A tented camp could be either a permanent camp or a semi-permanent camp. Both will be set-up in areas of excellent game viewing. 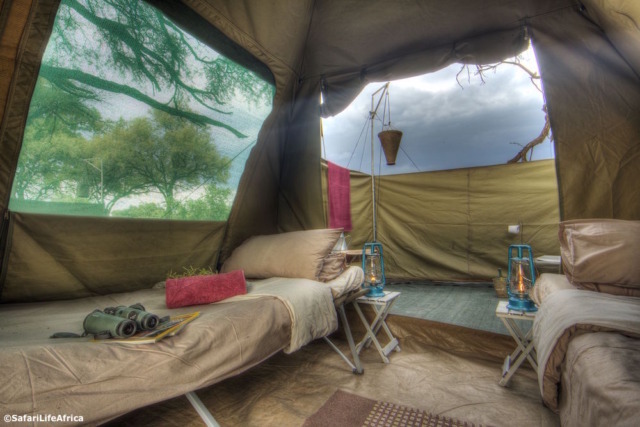 You’ll find semi-permanent camps for example very often in the Serengeti; the benefit is that these camps move with the great migration to maximize your chance of seeing this spectacle of nature. 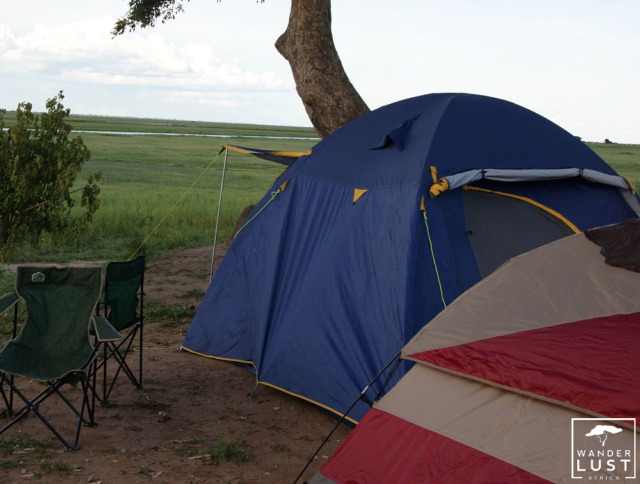 Classic Camping is often associated with a Overland Truck Safari. Tents are pitched in designated campsites in or near national parks. Depending on budget, you sleep on the floor with a sleeping mattress and sleeping bag or in a portable cot. 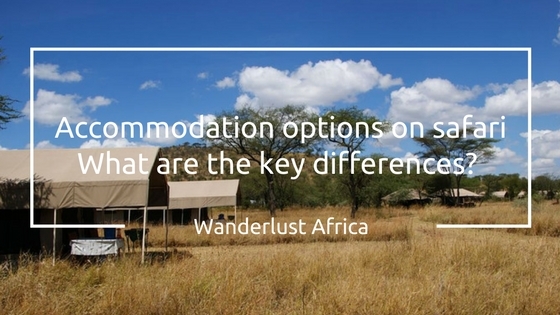 Shared bathroom facilities that are set up in permanent toilet and shower blocks. Depending on the type of safari, you either have a support team that prepares the meals for you or you participate hands-on. Mobile safaris are not to be confused with an overland truck tour. It’s a very exclusive experience as a mobile safari can be designed for a couple only or a group of friends traveling together. Guests are transferred either in a four wheel drive safari vehicle from one camp to the other or they reach each camp on a walking safari. Camps are individually set up by the support team, which usually includes your own cook. Bathroom facilities can vary from en-suite flush toilets and bucket showers to shared facilities. A mobile safari is the ultimate safari experience in regards to uniqueness and authenticity; a typical old style African safari. Ihr Safari Ratgeber mit 40 Seiten wertvoller Tipps und Informationen erleichtert Ihre nächste Safariplanung in Afrika! Melden Sie sich hierfür einfach zu unserem Newsletter an. In der Bestätigungs-E-Mail erhalten Sie den Download-Link zur PDF-Datei. Ihre Daten (Name, E-Mail Adresse) werden an die Datenschutz-zertifizierte Newsletter Software MailChimp zum technischen Versand weitergegeben. Weitere Informationen finden Sie in unserer Datenschutzerklärung. Ihre Daten (Name, E-Mail Adresse) werden an die Datenschutz-zertifizierte Newsletter Software MailChimp zum technischen Versand weitergegeben. Weitere Informationen finden Sie in unserer Datenschutzerklärung.